Some Good News! Member Carol Bailey-White Recognized for Her Service. Congratulations to Duval Audubon Society board member Carol Bailey-White, recipient of the 2017 Bob and Carol Grimes Foundation Environmental Award! The Bob and Carol Grimes Foundation for the Environment was established in 2006 to honor the memory of Robert G. “Bob” Grimes (1928-2001), a Jacksonville insurance executive who was active in The Audubon Society and volunteered for many local environment issues. Bob was appointed in the 1980’s by then-mayor Tommy Hazouri to form the Jacksonville Environmental Protection Board, which researched the issues of air pollution caused by idling cars at the tollbooths on bridges and by sulphurous “smell of money” pouring from Northeast Florida’s paper mills. These and other then-controversial issues resulted in today’s cleaner environment that is healthier for humans and all other life forms. The Grimes Foundation celebrates the courage of local individuals who take action to promote and protect our environment. Bob took to heart Rachel Carson’s belief that “We all must have a great sense of responsibility and not let things happen because everyone takes the comfortable view that someone else is looking after it. 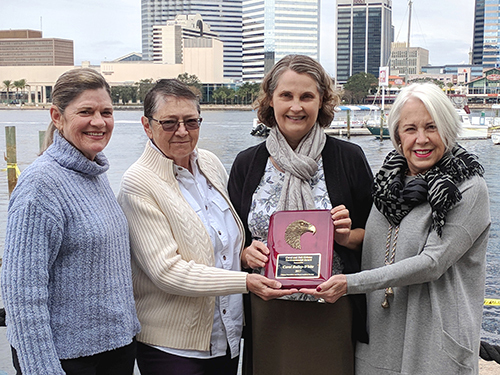 Someone else isn’t looking after it.” Founders Hugh Cotney, Carole Adams, and Carol Grimes each year present an award to a local individual who has taken on that “responsibility” to look after some aspect of the Northeast Florida environment. The award is intended to recognize the recipient as an example of how we can all become better stewards of the Earth. This year's recipient, Carol Bailey-White, retired from full-time work after 21 years with the Jacksonville Public Library, and in 2013 began working part-time for St. Johns Riverkeeper, a Jacksonville-based environmental nonprofit. There she manages the membership database, performs general office duties, and supports the efforts of the rest of the St. Johns Riverkeeper team. She has had a lifelong interest in nature and the outdoors and joined the Duval Audubon Society about eight years ago. Participating in our field trips has been a great learning experience. She notes that everyone in the group has been so generous in sharing their expertise. A few years ago, fortunately for us, she joined the board and became the treasurer. Currently she is Membership Chair as well as keeping up with social media for the organization. She readily shares her photographs and for several years has created a “Year In Review” video highlighting the chapter’s activities for the previous year. Check out our YouTube channel if you’re interested! 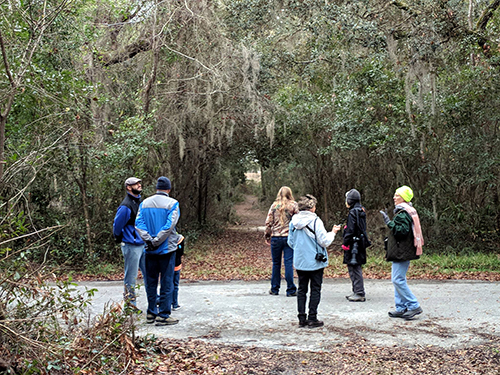 One of Duval Audubon’s greatest assets is our Crosby Sanctuary preserve in Orange Park, where we have a nature walk and work day on the fourth Saturday of every month. Our ultimate goal is to open Crosby Sanctuary to the public so everyone can enjoy this wonderful place, so during the work days we are pulling weeds, planting native plants, picking up trash and maintaining the trails. You can usually find Carol there! Carol modestly notes that she is not the type of person for going out and making speeches. She chooses to give support behind the scenes. We know these efforts may not very public, but realize this kind of support is critical to a successful organization. We thank her for her service! Some Sad News. Longtime Board Member Pat Anderson Passes Away. We are sad to report that longtime member, Patricia Marie Gollnick Anderson, passed away December 28, 2017 in Jacksonville, Florida. She is survived by her son Charles Anderson and her brother Theodore Gollnick. She was a University of Florida graduate and dedicated member of the Native Plant Society, Garden Club and Audubon Society. 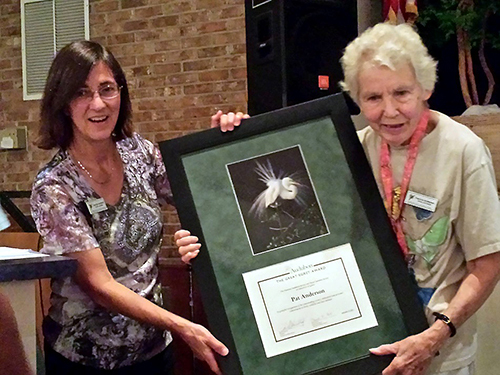 She served on the board of the Duval Audubon Society for an amazing 34 years! Pat was an avid gardener, passionate birder and steward of protecting wildlife habitat and natural resources. Here she is in 2014 receiving the Great Egret Award presented by Carolyn Antman, President of Duval Audubon at that time. This award is presented to individuals who have made significant contributions to Audubon’s mission for 20 or more years. After receiving the award, Pat remarked that she needed Audubon more than Audubon needed her. We don't think so. A memorial gathering will be scheduled for a later date. In lieu of flowers, donations may be made to Community Hospice or Duval Audubon Society. The month of December has been a productive one for sightings including a few uncommon birds. The Harlequin Duck continues in Nassau County. Clay has a Hairy Woodpecker at Mike Roess Gold Head Branch State Park that some of us keep hoping to see. Our Christmas Bird Count in Jacksonville on the 30th is shaping up to be another good tally. We'll report on that later. Here Carol Bailey-White snaps a photo of the Reddie Point team. We think Marie Chappell is wondering if there might be an Ovenbird down that path (and there was one)! 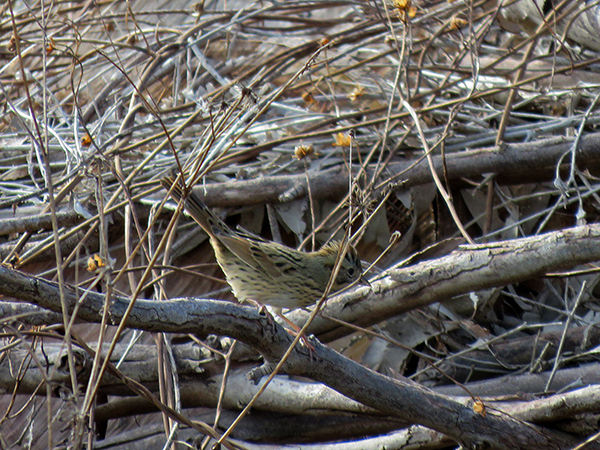 Some Duval Audubon members also assisted with the St. Augustine count on the 17th and spotted a Lincoln's Sparrow which was a nice find. January Program, January 22, 2018, 6:30 p.m. Birds of Paradise, Jewel-babblers and Paradise Kingfishers: Birding New Guinea! The huge tropical island of New Guinea, just north of Australia, is where the world's most spectacular birds lurk. And, that is meant literally - this island really is inhabited by the most ridiculously extravagant-looking birds on the planet. I'll take you on a photographic journey around the western (Indonesian) side of New Guinea. The journey will include the birds of the remote Arfak Mountains and of the idyllic Raja Ampat Islands where the exquisite Wilson's Bird of Paradise is fairly easy to find (if you know the right spot!). Wilson's Bird of Paradise is the most beautiful bird I have ever seen and was the highest point of my birding career (and I really mean that, but I still enjoy "normal" birding despite having experienced this (so don't worry). But it's not only the birds that make New Guinea amazing - many people visit the smaller outlying islands such as the Raja Ampat Archipelago for the fabulous scenery, snorkeling and sun.